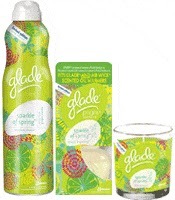 Glade is introducing a nice new Spring Collection and with this new collection they are offering a Buy One Glade Spring Collection Product and Get One Free! Get your Glade printable coupon today and also why not enter to win a $5000 Visa Card. You will need a UPC to enter the Sweepstakes but go ahead and get two for one with the coupon!